Syntax highlighting and indent style are often used to aid programmers in recognizing elements of source code. This Python code uses color coded highlighting. The parsing stage itself can be divided into two parts: the parse tree or "concrete syntax tree" which is determined by the grammar, but is generally far too detailed for practical use, and the abstract syntax tree (AST), which simplifies this into a usable form. The AST and contextual analysis steps can be considered a form of semantic analysis, as they are adding meaning and interpretation to the syntax, or alternatively as informal, manual implementations of syntactical rules that would be difficult or awkward to describe or implement formally. The levels generally correspond to levels in the Chomsky hierarchy. Words are in a regular language, specified in the lexical grammar, which is a Type-3 grammar, generally given as regular expressions. Phrases are in a context-free language (CFL), generally a deterministic context-free language (DCFL), specified in a phrase structure grammar, which is a Type-2 grammar, generally given as production rules in Backus–Naur form (BNF). Phrase grammars are often specified in much more constrained grammars than full context-free grammars, in order to make them easier to parse; while the LR parser can parse any DCFL in linear time, the simple LALR parser and even simpler LL parser are more efficient, but can only parse grammars whose production rules are constrained. In principle, contextual structure can be described by a context-sensitive grammar, and automatically analyzed by means such as attribute grammars, though in general this step is done manually, via name resolution rules and type checking, and implemented via a symbol table which stores names and types for each scope. Tools have been written that automatically generate a lexer from a lexical specification written in regular expressions and a parser from the phrase grammar written in BNF: this allows one to use declarative programming, rather than need to have procedural or functional programming. A notable example is the lex-yacc pair. 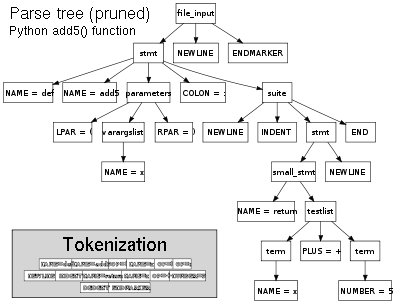 These automatically produce a concrete syntax tree; the parser writer must then manually write code describing how this is converted to an abstract syntax tree. Contextual analysis is also generally implemented manually. Despite the existence of these automatic tools, parsing is often implemented manually, for various reasons – perhaps the phrase structure is not context-free, or an alternative implementation improves performance or error-reporting, or allows the grammar to be changed more easily. Parsers are often written in functional languages, such as Haskell, or in scripting languages, such as Python or Perl, or in C or C++. Note that the lexer is unable to identify the first error – all it knows is that, after producing the token LEFT_PAREN, '(' the remainder of the program is invalid, since no word rule begins with '_'. The second error is detected at the parsing stage: The parser has identified the "list" production rule due to the '(' token (as the only match), and thus can give an error message; in general it may be ambiguous. Type errors and undeclared variable errors are sometimes considered to be syntax errors when they are detected at compile-time (which is usually the case when compiling strongly-typed languages), though it is common to classify these kinds of error as semantic errors instead. contains a type error because it adds a string literal to an integer literal. Type errors of this kind can be detected at compile-time: They can be detected during parsing (phrase analysis) if the compiler uses separate rules that allow "integerLiteral + integerLiteral" but not "stringLiteral + integerLiteral", though it is more likely that the compiler will use a parsing rule that allows all expressions of the form "LiteralOrIdentifier + LiteralOrIdentifier" and then the error will be detected during contextual analysis (when type checking occurs). In some cases this validation is not done by the compiler, and these errors are only detected at runtime. is syntactically valid at the phrase level, but the correctness of the types of a and b can only be determined at runtime, as variables do not have types in Python, only values do. Whereas there is disagreement about whether a type error detected by the compiler should be called a syntax error (rather than a static semantic error), type errors which can only be detected at program execution time are always regarded as semantic rather than syntax errors. The syntax of textual programming languages is usually defined using a combination of regular expressions (for lexical structure) and Backus–Naur form (for grammatical structure) to inductively specify syntactic categories (nonterminals) and terminal symbols. Syntactic categories are defined by rules called productions, which specify the values that belong to a particular syntactic category. 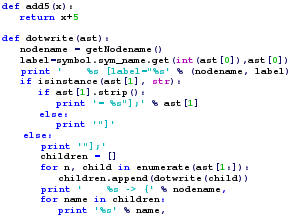 Terminal symbols are the concrete characters or strings of characters (for example keywords such as define, if, let, or void) from which syntactically valid programs are constructed. A language can have different equivalent grammars, such as equivalent regular expressions (at the lexical levels), or different phrase rules which generate the same language. Using a broader category of grammars, such as LR grammars, can allow shorter or simpler grammars compared with more restricted categories, such as LL grammar, which may require longer grammars with more rules. Different but equivalent phrase grammars yield different parse trees, though the underlying language (set of valid documents) is the same. Here the decimal digits, upper- and lower-case characters, and parentheses are terminal symbols. The grammar needed to specify a programming language can be classified by its position in the Chomsky hierarchy. The phrase grammar of most programming languages can be specified using a Type-2 grammar, i.e., they are context-free grammars, though the overall syntax is context-sensitive (due to variable declarations and nested scopes), hence Type-1. However, there are exceptions, and for some languages the phrase grammar is Type-0 (Turing-complete). In some languages like Perl and Lisp the specification (or implementation) of the language allows constructs that execute during the parsing phase. Furthermore, these languages have constructs that allow the programmer to alter the behavior of the parser. This combination effectively blurs the distinction between parsing and execution, and makes syntax analysis an undecidable problem in these languages, meaning that the parsing phase may not finish. For example, in Perl it is possible to execute code during parsing using a BEGIN statement, and Perl function prototypes may alter the syntactic interpretation, and possibly even the syntactic validity of the remaining code. Colloquially this is referred to as "only Perl can parse Perl" (because code must be executed during parsing, and can modify the grammar), or more strongly "even Perl cannot parse Perl" (because it is undecidable). Similarly, Lisp macros introduced by the defmacro syntax also execute during parsing, meaning that a Lisp compiler must have an entire Lisp run-time system present. In contrast, C macros are merely string replacements, and do not require code execution. The syntax of a language describes the form of a valid program, but does not provide any information about the meaning of the program or the results of executing that program. The meaning given to a combination of symbols is handled by semantics (either formal or hard-coded in a reference implementation). Not all syntactically correct programs are semantically correct. Many syntactically correct programs are nonetheless ill-formed, per the language's rules; and may (depending on the language specification and the soundness of the implementation) result in an error on translation or execution. In some cases, such programs may exhibit undefined behavior. Even when a program is well-defined within a language, it may still have a meaning that is not intended by the person who wrote it. "Colorless green ideas sleep furiously." is grammatically well formed but has no generally accepted meaning. "John is a married bachelor." is grammatically well formed but expresses a meaning that cannot be true. is syntactically valid, but not semantically defined, as it uses an uninitialized variable. Even though compilers for some programming languages (e.g., Java and C#) would detect uninitialized variable errors of this kind, they should be regarded as semantic errors rather than syntax errors. ^ a b Friedman, Daniel P.; Mitchell Wand; Christopher T. Haynes (1992). Essentials of Programming Languages (1st ed.). The MIT Press. ISBN 0-262-06145-7. ^ Aho, Alfred V.; Monica S. Lam; Ravi Sethi; Jeffrey D. Ullman (2007). Compilers: Principles, Techniques, and Tools (2nd ed.). Addison Wesley. ISBN 0-321-48681-1. Section 4.1.3: Syntax Error Handling, pp.194–195. ^ Louden, Kenneth C. (1997). Compiler Construction: Principles and Practice. Brooks/Cole. ISBN 981-243-694-4. Exercise 1.3, pp.27–28. ^ Michael Sipser (1997). Introduction to the Theory of Computation. PWS Publishing. ISBN 0-534-94728-X. Section 2.2: Pushdown Automata, pp.101–114. ^ "An Introduction to Common Lisp Macros". Apl.jhu.edu. 1996-02-08. Archived from the original on 2013-08-06. Retrieved 2013-08-17. ^ "The Common Lisp Cookbook - Macros and Backquote". Cl-cookbook.sourceforge.net. 2007-01-16. Retrieved 2013-08-17. ^ Issue of syntax or semantics?